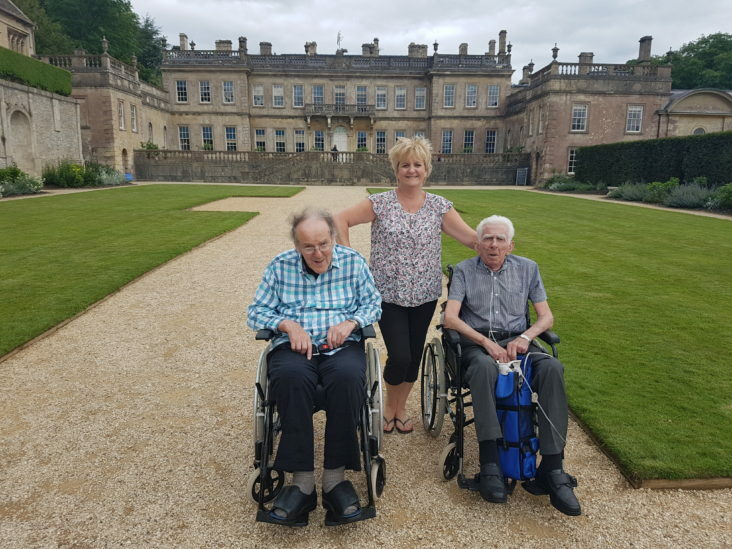 On 31st May four of our residents Danny York, James Elliott, Edward Horesh and Jean Kemmery went out on a trip to see the beautiful ancient deer park, seventeenth century house and garden at Dyrham Park. They were accompanied by four staff – Denise Harris (Senior Carer), Veronica Ward (Carer), Kristyna Jancikova (Registered Nurse), and Michelle Jenner (Activities Co-ordinator). Three residents chose to go around the house – Edward (with Kristyna), Danny (with Denise) and James (with Veronica). All the National Trust staff were very helpful and co-operative. All the residents visited the gardens and were very impressed. Veronica took James around the gardens and the pond. Denise took Danny around the gardens and the pond. Some areas are difficult for wheelchairs, such as the cobbled courtyard and some gravel in the gardens and steep slopes. These difficulties were negotiated successfully by the well trained staff, who all have moving and handling training. Previous successful trips have included outings to National Trust ‘Courts Gardens’, Prior Park Garden Centre, Chew Valley Lake, and ‘Salt & Malt’ café. A visit to Bath City Farm for ‘Feathered Friends’ a sociable chicken keeping/cuddling project, for the over 60s and those living with dementia, and their carers is planned next.